Forget the NES Classic—this is the vintage system we’ve been waiting for. 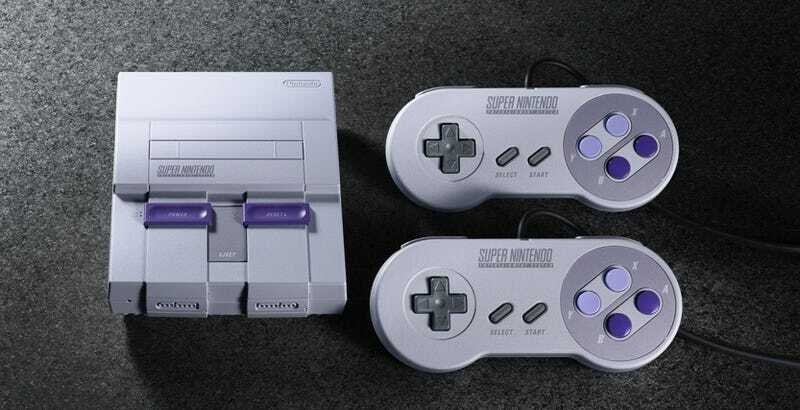 Nintendo today announced the Super Nintendo Classic, which will be out on September 29 for $80 and come with 21 games including the previously unreleased Star Fox 2. The lineup, which is excellent, also includes Earthbound, Final Fantasy III, Link to the Past, and Secret of Mana. And Super Mario World and Donkey Kong Country and holy crap this thing is going to be impossible to get at a store without gouging someone’s eyes out, isn’t it? The system also comes with an HDMI cable, a charging cable, and two SNES controllers so you can beat up your friends in Street Fighter. The SNES Classic controller cable will be five feet, Nintendo tells Kotaku. For comparison, that’s about two feet longer than the NES Classic controller’s tiny cord. UPDATE (1:53pm): When asked by Kotaku, Nintendo said it does plan to ship more SNES Classics than NES Classics, but only this year. We aren’t providing specific numbers, but we will produce significantly more units of Super NES Classic Edition than we did of NES Classic Edition.